This can’t be happening. It can’t. Can it? Are you really turning ONE already? Where has the past year gone? Wasn’t it just yesterday that I was washing your burp cloths and putting on your mittens (even though they didn’t stay on for more than a few minutes!) What about watching you smile as you tried to prop your head up or tummy times which would tire you out so quickly? Your strong personality is starting to show through now. You are not afraid. You also love to eat, be it food or not! Your four tiny teeth can chomp through anything! You love to play with coloured balls and enjoy splashing in the bath. You are mesmerised by fishes but you hate changing your clothes. You also love to throw things on the floor as you look down from your highchair and then shut your eyes as you hear the crash and boom. You have a wierd habit of wanting to lift heavy objects and I can’t comprehend why! You were so light when I first carried you in my arms, and now my back begins to ache as I lift you up. You would stay where ever I lay you down, and now you are at the opposite side of the room in the blink of an eye. You would look at me with gaping eyes in silence, and now you babble away furiously at me, hand gestures and all! My love for you grows day by day and my heart fills with so much pride when I see you and know you are mine. The naughty twinkle in your eye along with that funny little monkey face you pull is surely going to give me grief as you grow older, but these memories will make it all worthwhile. You are now one year old and I hope you grow on to see many more years with the same amount of zeal as you posses now. You will change even more, learn so much more and find new ways to irritate me too! But to me, you will always be my little baby boy. Happy First Birthday Baby Z! May you be blessed with bucketful amounts of love, everlasting happiness, good health and humble success. You make Daddy and I so so so happy and proud! You are our biggest blessing! But wait… this can’t be happening, can it? Are you really turning ONE already? If you liked this, why not check out my post Happy One Year of Motherhood to me! How did you feel when your baby turned ONE? Feel free to share your thoughts in the comments section below! 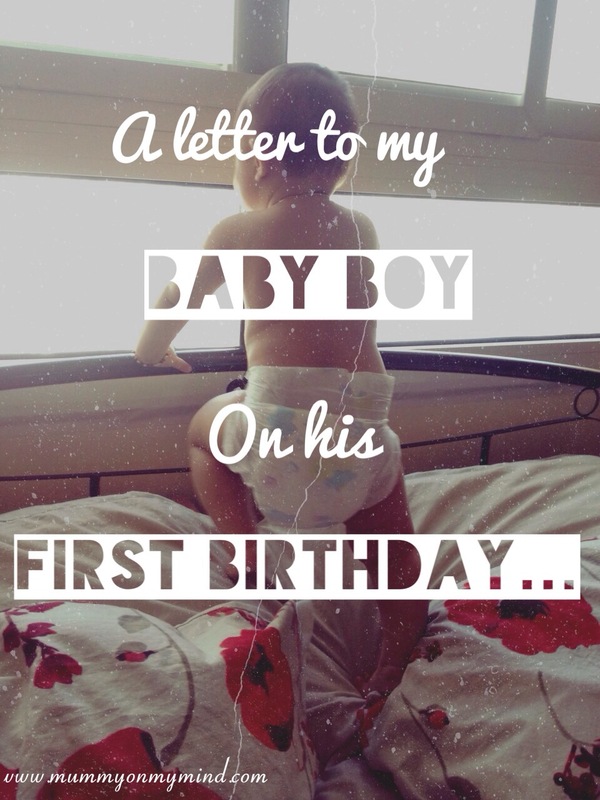 Also, go ahead and read my letters to Baby Z on his Second Birthday here , Third Birthday here and Fourth Birthday here. Thankyou! I hope so too! ? Thank you for your lovely comment! ? Thankyou for your kind comment! Yes the first year really has zoomed by! Haha the fake cry always happens at the most crucial times when I need to get some thing done!! Thankyou! Yes all day I was thinking about what i was up to this time last year and its all really so emotional how far Baby Z has come in just a year! Thank you! It really is such an emotional time! They really do! Its incredible how the first year just whizzes by! It really does zoom by! I am sure its only going to get quicker from here on! Thanks for reading! Thank you! The days and months are just whizzing by so quickly!! Happy 2nd Birthday to your little one! Our sons could be two peas in a pod! Thoroughly enjoyed reading this, I could identify with every word. My son is 15 months old now and I just can’t comprehend how quickly time really flies when having fun. I want to freeze a tiny snippet of time so I can keep him in my arms forever but also can’t wait to watch him grow. Aww I completely agree to that last statement! Glad you enjoyed it, and thanks for reading! You’ve crafted a lovely letter to your baby. I could see the love you have for your child as I read your missive. Thank you very much for making my evening that much better. Aww that’s very sweet to say… Thank you so much reading! ?